Anybody who has attended a Bridges conference in past ten years will be familiar with the work of Rinus Roelofs. His talks always offer an entertaining contrast: stunning and inspiring ideas in the intersection of geometry and art, balanced with his humble, low-key delivery. It was also Rinus who suggested that I try Rhino3D for 3D modelling, which means that I should thank him for giving me the tools I needed to create 3D printed models like the Rocket Espresso Cup. Rinus has spoken for many years on what he calls “interwoven surfaces”. Usually, these are shapes made up of two (or more) layers, where elements from one layer weave into elements from the other, and vice versa. Sometimes, the result is two surfaces that are linked but not connected, like links in a chain. What’s more fascinating is when the result is a single surface, usually with holes that are tied into knots. 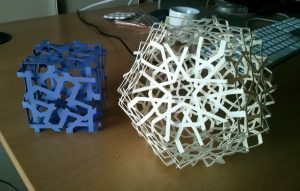 At Bridges 2016 in Finland, Rinus upped the ante: in addition to talking about his newest ideas, he handed out laser-cut paper templates that could be folded up into interwoven polyhedral sculptures. Finally, I had interwoven surfaces of my very own, which I could take home for further contemplation. Interwoven cube and tetrahedron by Rinus Roelofs. 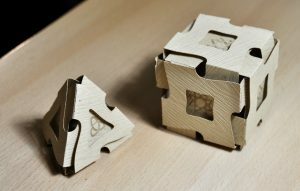 These templates come as single sheets of laser-cut paper, which can be folded up to wrap twice around their respective polyhedra, creating two layers. Around the same time, I was offered an opportunity to display some art in a case outside the office of the president of my university. 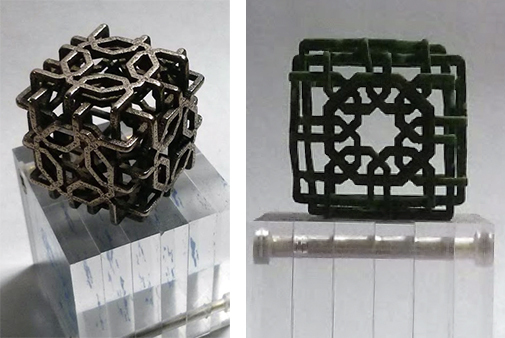 I settled on a series of 3D printed spherical Islamic designs—I’ve already got a bunch sitting in my office. But I wanted to create one new one, a larger model to serve as a centrepiece. 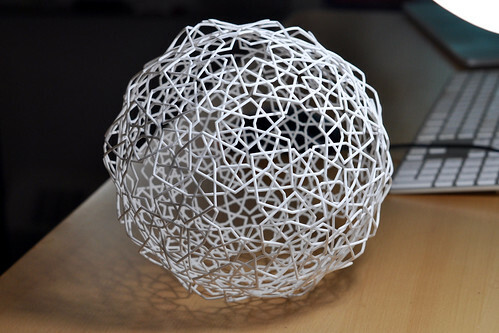 I decided to work on designing a new sphere inspired by Rinus’ interwoven surfaces. Interwoven Islamic star ball in White, Strong and Flexible. The sculpture is based directly on one of the flat designs in Bourgoin’s collection of drawings, but with stars teased apart into upper and lower layers that add up to yield the original design. This model is about 20 centimetres in diameter, bigger than just about anything I’ve 3D printed before (with the possible exception of the bunny bunny). You can find a more complete collection of photos of this model on flickr. A small Islamic “charm” in the form of a cube with two interwoven layers. 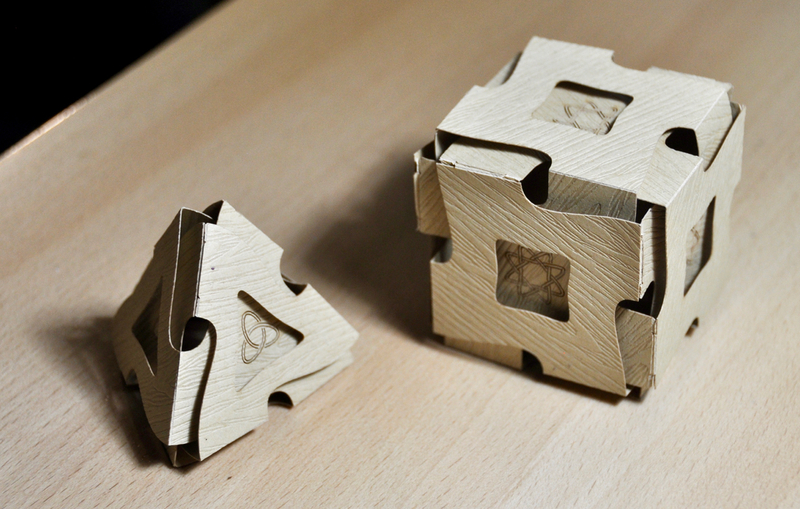 The model is printed in metal on the left and plastic on the right. The model is available on Shapeways. It later became clear that I should write up a paper on this subject for Bridges 2017 (which I’m hosting in Waterloo, but that’s another story!). That paper has been submitted for review, and hopefully I’ll be able to share it here when I have prepared the final version. In preparing the report, I created a few additional designs that were pretty, but difficult to visualize as rendered 3D models. Instead, I ended up building a couple of paper sculptures by cutting templates out using an inexpensive computer-controlled knife cutter. The result was a lot of fun, meaning that I’ll probably explore these designs a bit more, and possibly write up an expanded paper on the subject in the future. Two interwoven Islamic patterns in paper, with modular components cut out using a computer-controlled knife cutter. 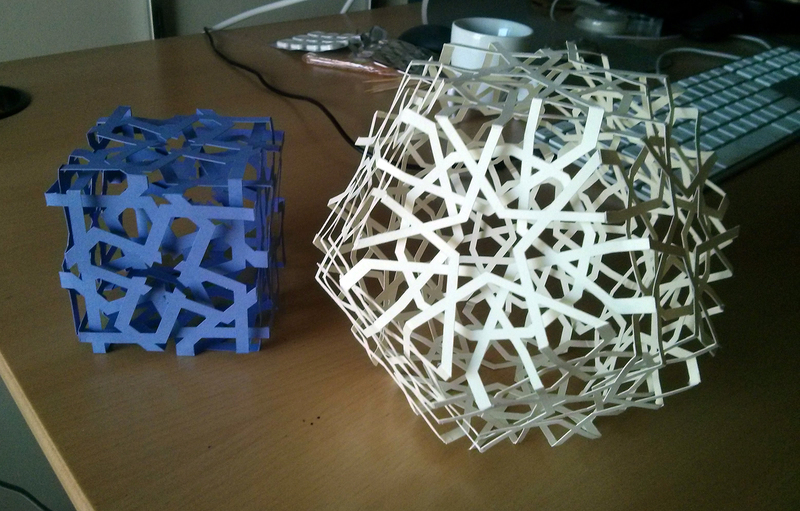 if you’re feeling adventurous, here are paper templates for the cube and dodecahedron sculptures above. Sorry, they don’t come with instructions beyond the photo above. Email me if you build them! 3 Responses to "Interwoven Islamic geometric patterns"
Outstanding work! Your 2D Islamic geometric patterns were beautiful, and the writeup you wrote about them was great. I can’t wait to learn more about how you did the 3D version! Thanks! The final version of the paper should be online by the end of April at the latest. These are stunningly beautiful! Bravo!